Cantonese cuisine is a simplified traditional Chinese cuisine which comes from Guangdong province and is one of the Eight Culinary Traditions of Chinese cuisine. The ingredients used in Cantonese cuisine, are spring onion, sugar, salt, soy sauce, rice wine, cornstarch, vinegar, scallion oil, and sesame oil, to enhance the flavour, garlic is heavily used in some of the dishes. 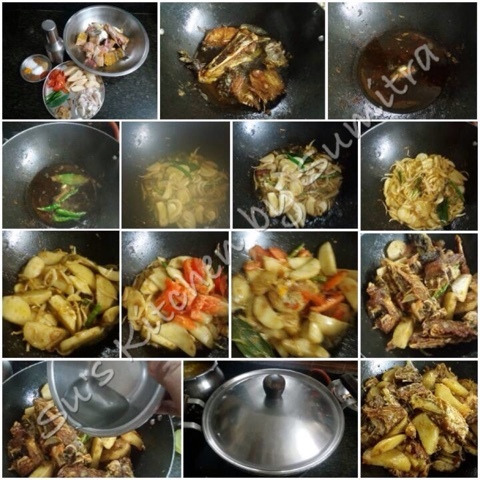 Ginger, chilli peppers, five-spice powder, black pepper powder, star anise and a few other spices are also used. This dish is good for starters. The sugar balances the flavour of the sourness. Love the flavour of the garlic. Take a wok or a fry pan, add oil. Heat up the oil. Add the sausages and stir fry for a minute. Add the whole garlic, green chillies and onions. 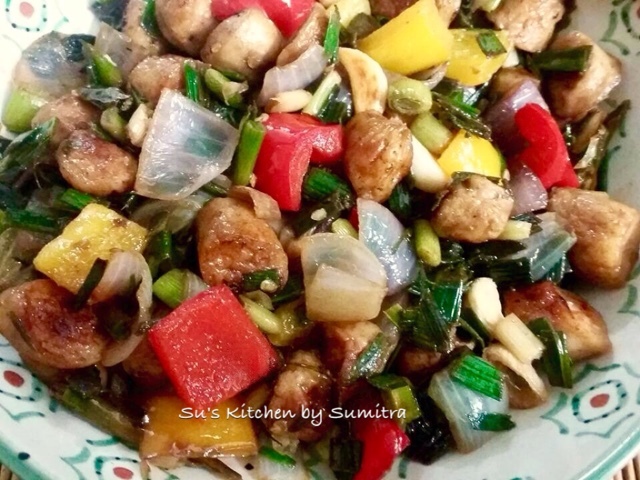 Stir fry on high flame till the onions are light pink in colour. Add the capsicum and stir for 2 minutes. Add the green garlic leaves. Stir for a minute. Add the vinegar, soya sauce, chilli sauce, sugar, salt and pepper powder. Stir for a minute and serve it hot. This is an excellent recipe to have with evening tea or as a starter. The fish is boiled and mashed with boiled potatoes and vegetables and then set in a steamer or steamed in any vessel till it sets. 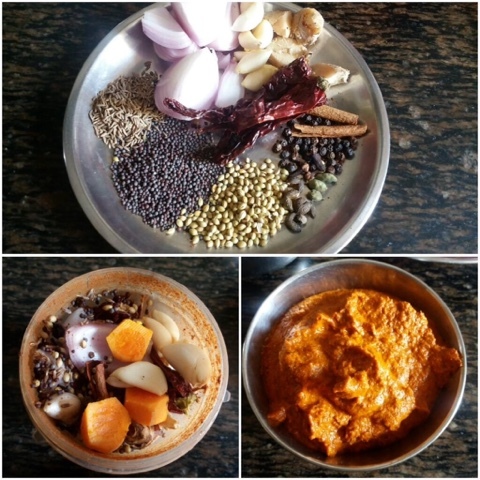 This recipe is an experiment in my kitchen and has a touch of Bengal as I have used Kasundi in it. 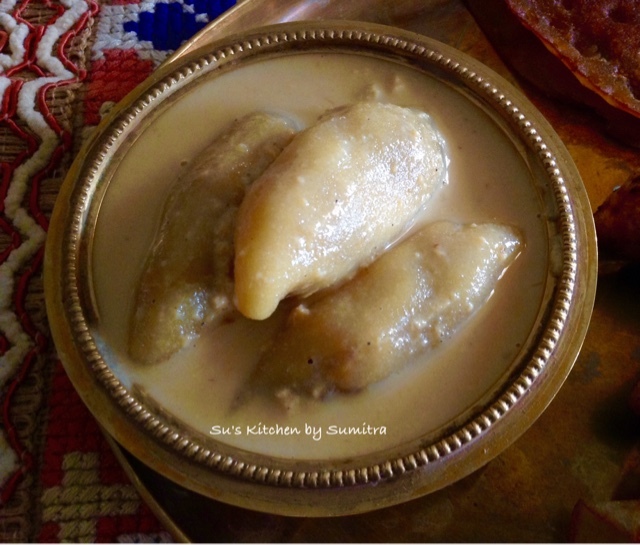 It's a very healthy recipe as there is very less oil content which has come from kasundi. For the bread crumbs, I have used whole wheat bread crumbs. 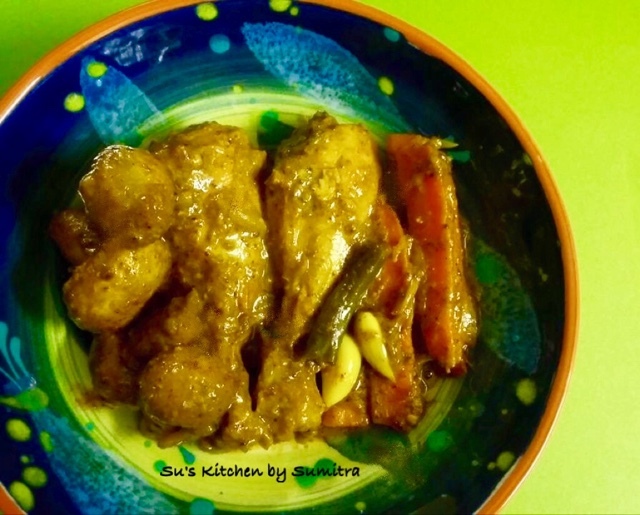 I am sure you will love my recipe as much as I did making it. I am sure you will try it out. 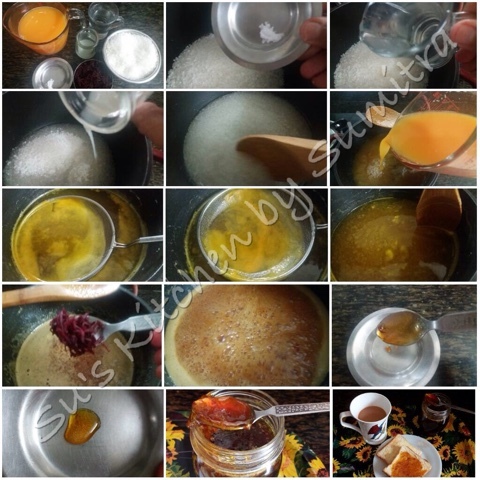 Take a mixing bowl and mix all the ingredients together very well, except for the oil. Take a greased baking pan. Pour the mixture in to the container and spread it. You can steam it in a steamer or take a wok, add water, place a napkin at the base. Place the container with the lid on. Cover the wok and steam it for 20 to 30 minutes or till the mixture has set. To check, insert a tooth pick. Cool it down. Cut it into pieces and serve it with more Kasundi. 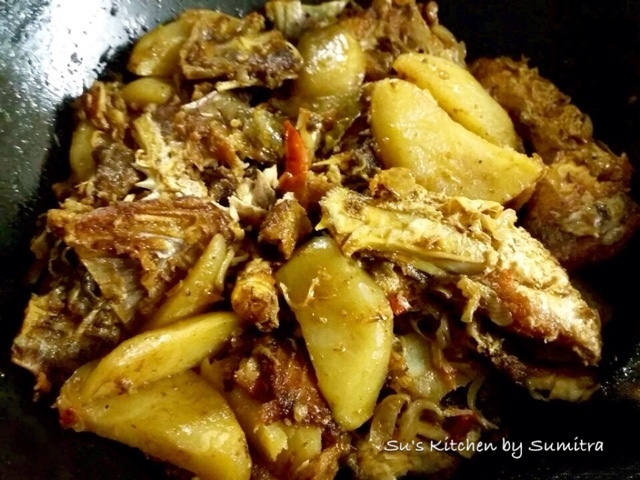 This dish taste scrumptious with hot steaming rice. 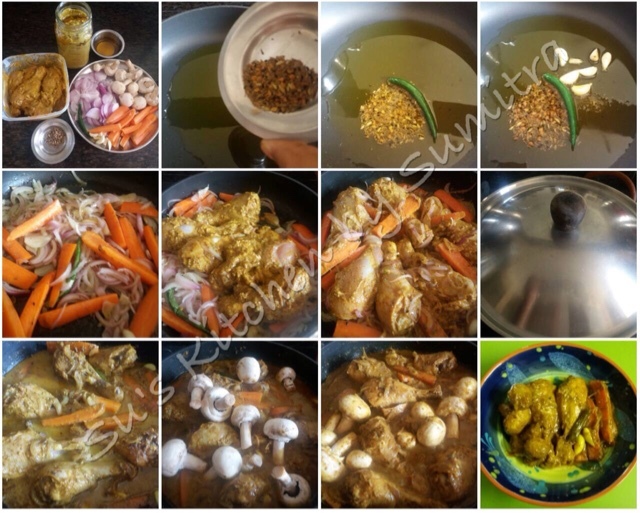 I have used home made Kasundi ( Mustard Sauce ) to marinate the chicken along with the other ingredients. You can use ready made Kasundi available in the market. 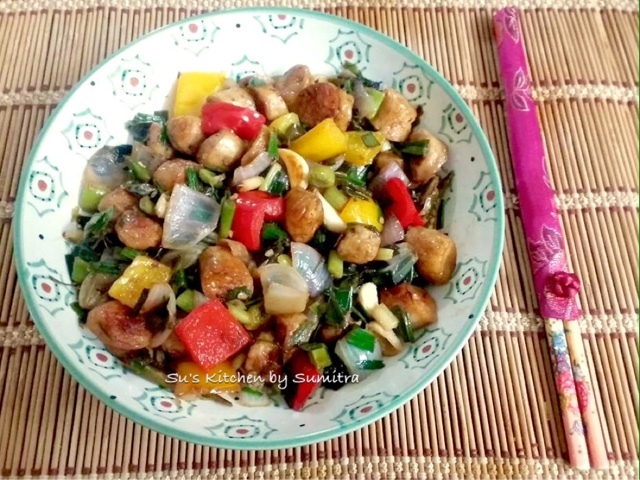 I have added mushrooms and carrot to the dish. You can add potatoes too. I love little sweetness of the carrot with Kasundi. This is an experiment in my kitchen. Do try it out... I am sure you will enjoy it. 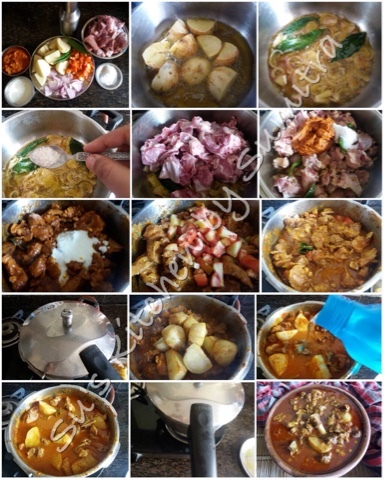 Mix all the above ingredients together and let it marinate for an hour. Take a fry pan, add oil. Let it come to a smoking point. Lower the flame and reduce the heat. Add the Panch phoran. Let it crackle. 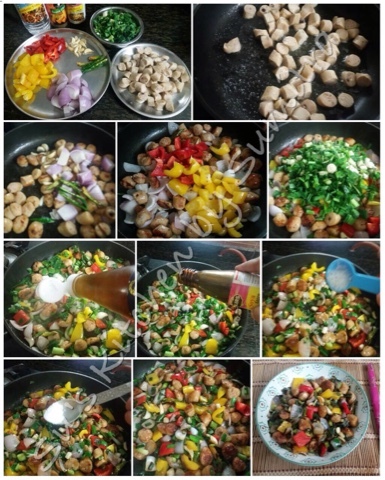 Add the green chilli and sauté for few seconds. Add the garlic and sauté for few more seconds. Add the onions and carrots, sauté till the onions are light pink in colour. Add the marinated chicken, stir, cover and cook for 10 minutes. Add 1/2 cup water, let it cook for 10 minutes more. Add the mushrooms, stir and cook till the mushrooms have cooked and the water has reduced. 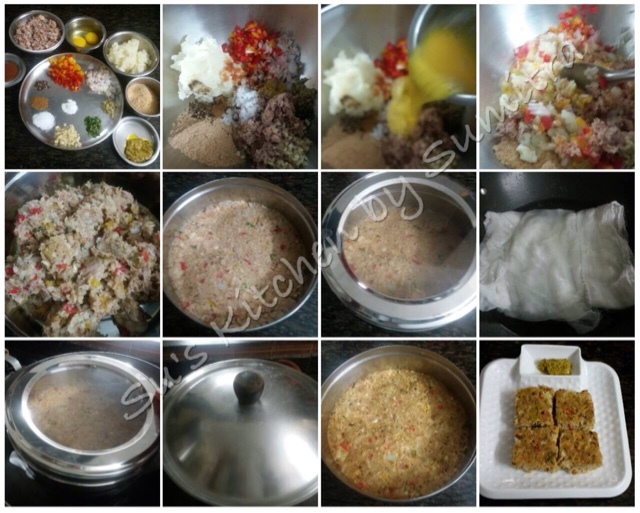 Serve it hot..
To make this pitha, first stuffing is made. Then the batter is made. Little portion of the stuffing is taken and dipped in to the batter and fried. Then the fried balls are dipped into the sugar syrup. Take a pan, add the coconut, sugar, Jaggary and salt, stir it on a low flame till the coconut becomes dry. Add Mawa , cardamom and raisins.Cook for another couple of minutes till the mixture is dry. Pour in a bowl and let it cool down. Take a mixing bowl. Add flour, salt, sugar and semolina. Mix it. Add milk little at a time to make the thick batter. Cover and let the batter stand for 30 minutes. Take a heavy bottom pan, add all the above and boil it to get thick syrup. Heat the oil in a wok. Mean while make lime size balls of the stuffing. Dip these balls one by one in the batter and coat the balls. Add the balls in the hot oil. Fry on very low heat till they are golden brown in colour. Drain the oil and immediately drop them in the warm syrup. Let it stand for an hour to soften. Gokul pitha is ready to be eaten and celebrate Poush Sankranti. 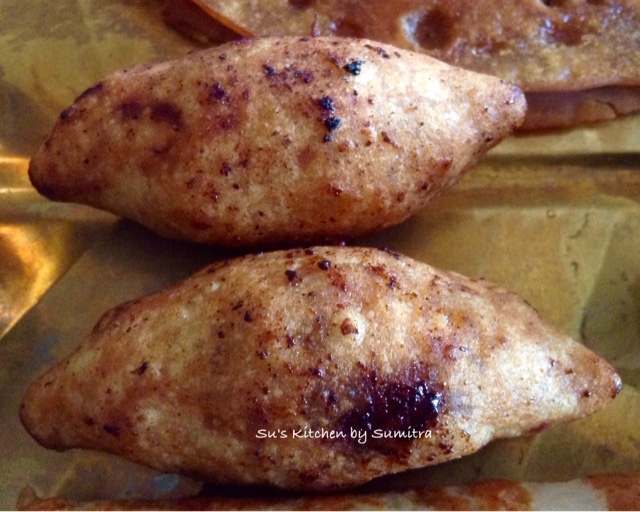 This is made with rice flour and all purpose flour, mixed together with jaggery water an made into a batter. Then the batter is cooked into a kind of a sweet dosa. This Pitha is made with rice flour which is kneaded into a dough. A lime size portion is taken from the dough and stuffed with coconut and jaggary. Then it is given a shape and fried in oil. Take a pan, add the Jaggary, Cardomom and salt, stir it on a low flame till it melts. Add the coconut and stir on low heat till the mixture becomes dry. Switch off the flame and let it cool down. To make the dumplings, take the flour and add the salt in a mixing bowl, add warm water little at a time. Knead it into a soft dough. Keep the dough covered as the dough will becomes hard if kept open. Take lemon size balls from the dough. Flatten the balls with your fingers in the shape of a bowl. The shell would be medium thin. Fill the stuffing into it. Close, fold and seal the edges of the dough. Give it a boat shape with 2 edges pointing outwards. Heat oil or ghee in a wok, Heat the oil or ghee. Add the stuffed dumplings in the oil and fry it till golden brown. 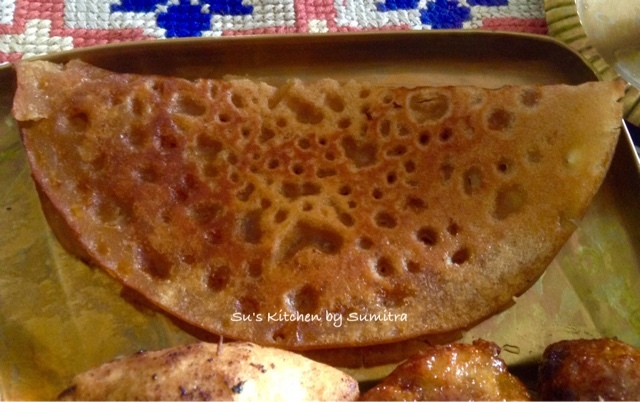 This Pitha is made with rice flour which is kneaded into a dough. Then the little portion of the dough is stuffed with coconut and jaggary. Then it is given a shape and boiled in milk. Add the milk in a pot and keep it on low flame till it reduces a bit. Add salt, Cardomon powder and Jaggary and let it simmer for 15 minutes. Meanwhile we will get the dumplings ready. Take lemon size balls from the dough. Flatten the balls with your fingers in the shape of a bowl. The shell would be medium thin. Fill the stuffing into it. Close, fold and seal the edges of the dough. Give it a boat shape with 2 edges pointing outwards. Once the kheer has simmer for 15 minutes, add the dumplings into the kheer. Let it simmer for 10 to 15 minutes more, till the dumplings are cooked. 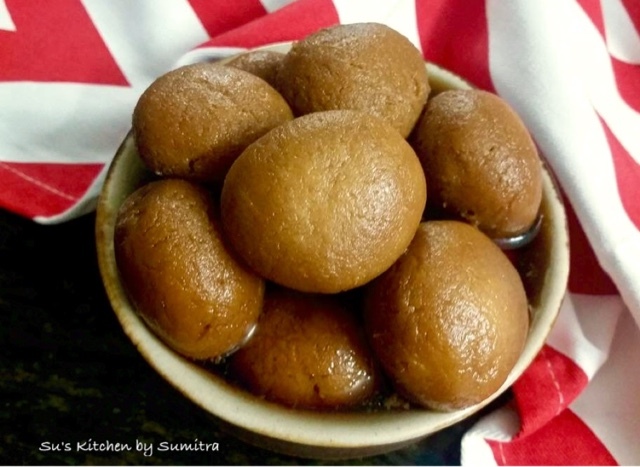 This Rasgullas are made with Notun / Nolen Gur / Date Jaggery. Date jaggery is made in winter season and is sold in the market either in liquid form called Jhola Gur or solid blocks called Patali / Nolen Gur or Notun Gur. 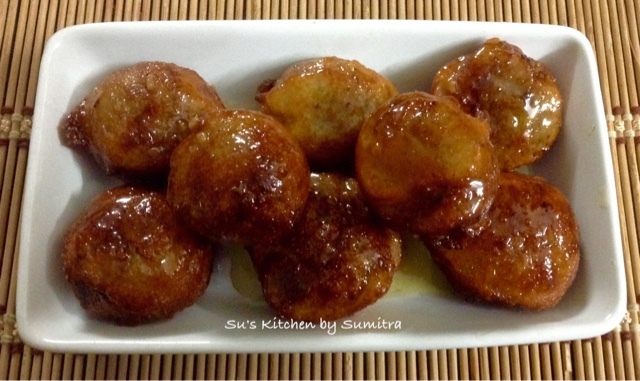 The recipe of the Rasgulla is the same, only date jaggery is added to the syrup. 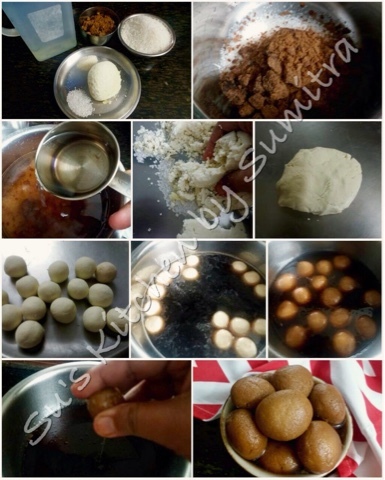 Rasgulla making is a easy task, only few tips to be remembered. Cow milk is best to make the rasgulla. While making the cheena / paneer, after the sour agent is added don't over boil the milk after it curdles other wise the cheena will become hard. Squeeze out the whey completely from the cheena, but at the same time cheena should be moist enough to bind into a smooth soft dough. Knead the cheena very well by rubbing the cheena with the help of your palm on a flat surface. Knead the cheena for 10 minutes. If you feel that the cheena has become hard and it is not binding, then add few drops of milk or water while kneading. I have added suji and sugar. You can also replace suji with flour. I am sure you will enjoy making them too. Take a deep bottom pot. Add the sugar, date jaggery and water. Let the jaggery and sugar melt. Let it simmer. Meanwhile on a flat surface, start kneading the cheena, suji and sugar for 10 minutes rubbing the cheena with the heel of the palm until smooth and it binds into a dough. Make small lime size portions and roll them into balls. Drop the balls into the syrup. Cover and cook for 15 minutes on medium heat. Open the lid and let it cook for 5 minutes on low heat. Switch off the flame, wait till it cools down before serving. Jam and Jelly making is so much fun. More over it is home made and without any preservatives added. Only we should know the right time to remove it from the flame. If undercooked it will not set and if overcooked it might be then difficult to use it. 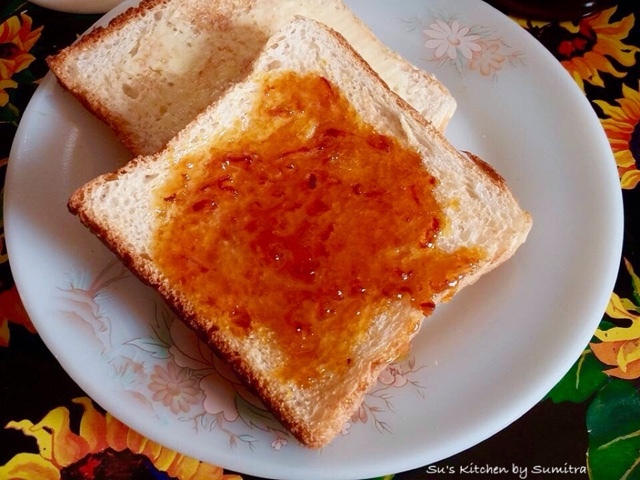 This jam can be used for applying on breads and also can be eaten with parathas and rotis. It is an experiment in my kitchen. In a heavy bottomed pot, add sugar, water, lime juice and salt. Stir and let the sugar dissolve on low flame. Add the orange juice. Stirring it occasionally let the orange juice simmer on low flame. Take a fine skimmer and keep clearing the scum at the top. Also keep clearing the sides of the pot. Let the juice reduce and thickens up, add the grated beetroot and let it continue to simmer. 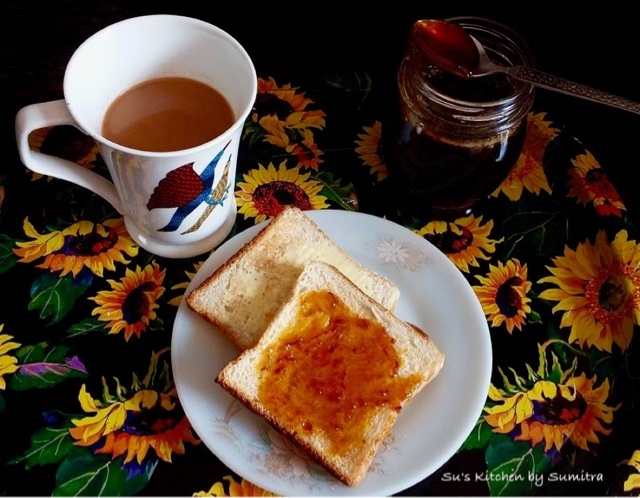 To check if the jam is ready, take a small steel plate, keep it in the fridge and cool it. Take the plate and pour 1/4 tsp of the jam, if the jam starts to set then it is done. Cool it a bit. 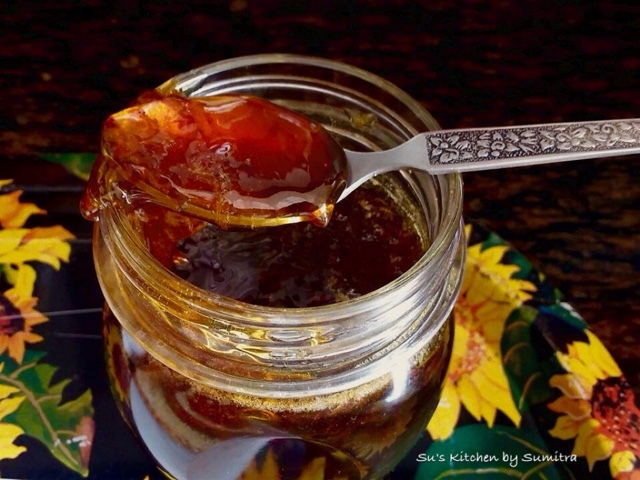 Take a clean glass bottle and pour the jam in the bottle and let it set in the bottle. Enjoy it with bread, roti or paratha. Bhetki head and bones cut into pieces marinated for 5 minutes with 1/2 tsp Turmeric powder and salt. Take a wok. Add mustard oil. Heat it till the smoking point. Reduce the flame. Fry the bone and the head till golden brown in colour. Remove it from the wok and keep it aside. In the same oil add the cinnamon, green cardomom and cloves. Let it crackle. Add the bay leaf and the green chillies. Add the onions and sauté it till light brown in colour. Add the ginger - garlic paste. Sauté for a minute. Add the potatoes. Stir fry the potatoes for a minute. Add the tomato. Stir it. Add the salt, sugar, turmeric powder, chilli powder, cumin powder, coriander powder and garam masala powder. Stir it and add the fish bones. Stir and add 1/2 cup water. Cover and cook till the potatoes are cooked and the water has evaporated. Server it hot with hot steaming rice. 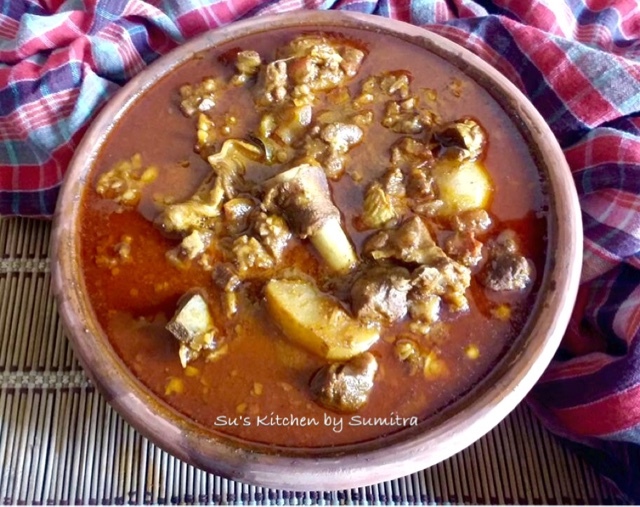 Mangsher Jhol is known to all Bengalis. It is cooked on all occasions. In earlier days and still in some household fresh spices are ground for the masala, but now a days mostly powdered spices have taken over. 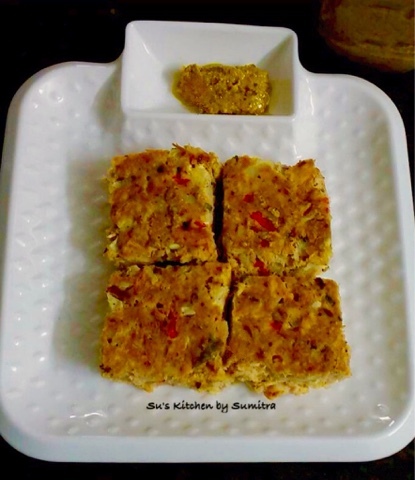 In this recipe in addition to the garam masala used in Bengali kitchen, I have used few more other spices as an experiment in my kitchen, This dish can be eaten with hot steamed rice or paratha or luchi. Add all the above ingredients into a grinder and add little water. Grind all the ingredients into a fine paste. Take a pressure cooker. Add mustard oil. Let it heat till the smoking point. Reduce the flame. Fry the potatoes till brown in colour. Remove it from the oil and keep it aside. In the same oil, add the onion, chillies and bay leaves. Fry the onions for a minute, add sugar and fry till light brown in colour. Add the mutton pieces, stir fry for 2 minutes. Add the bata mashala and salt. Stir and cook for 5 minutes. Add the curd. Stir and cook for 2 minutes. Add the tomatoes. Stir, cover and cook for 10 minutes on low flame. Remove the cover and add the potatoes. Stir and add 6 cups of water. Close the lid of pressure cooker. Give 4 whistles. Switch off the flame. Let all the pressure release. Serve it hot.